Nordea Bank S.A. in Switzerland is in the process of downsizing in the way Sydbank did, we believe. We may recall that this other bank, after cheating the tax offices of several European countries out of millions, was forced to close down (an acclaimed Julie Toft, from the Jyllands Posten, was responsible for the mess Sydbank got involved in). Now Nordea, keen to cover their tracks, have been erasing very incriminating web-based information so that lawyers acting for Spanish-based Equity Release victims could not prove certain questions of fact, principally related to Inheritance Tax evasion. Watch this information whilst it lasts in Google cache! Nordea Bank S.A. lawyers use the tactics that you would expect to find in what is called a Rambo lawyer. They will try to distract the Courts with various underhanded moves and confuse them, attempting to win at any cost even if it is at the expense of the credibility of their own client. Let us explain further: Nordea Bank S.A. Luxembourg operates in Spain via its Marbella office, run by podgy Jesper Hertz. Some of the contracts that Nordea Bank S.A. signed with their very unfortunate clients were done so by the Luxembourg based Nordea, which is an S.A. (kind of plc), whereas others were by the company Nordea Bank S.A. Luxembourg, Zweigniederlassung Zürich, which their Swiss branch. According to Nordea’s clever lawyers, the Swiss branch is a separate company altogether and is to be sued separately, as it has no connection with the Luxembourg parent company from where it has taken its name (we are sure of that, yeah, it was actually us who put them in touch with each other and that is why they now get on famously). – Nordea Bank S.A. Luxembourg, Zweigniederlassung Zürich is not authorized to operate in Spain, according to the Bank of Spain. So if it is not legally authorized, how come they offer banking products here? – Nordea Bank S.A. Luxembourg, Zweigniederlassung Zürich uses Jesper Hertz to sign all of its contracts, as does its parent company. That surely must be a coincidence! – Nordea Bank S.A. Luxembourg, Zweigniederlassung Zürich responds to clients’ letters through their Luxembourg office…strange? – Nordea Bank S.A. Luxembourg, Zweigniederlassung Zürich responds to clients’ angry letters with letterheaded paper from their Luxembourg parent company…they must have run out of corporate stationery. But realistically, who is surprised by a banking conglomerate that invites people, with properties in Spain, through their prolific advertising offered from their Spanish branch office, to defraud the Spanish Tax Office? We can today say that Danske Bank Luxembourg, operating from their offices in Centro Comercial Idea, Carretera Fuengirola Mijas, was definitely successful in spreading the story that taking out a mortgage on your home to avoid Spanish taxes was the best thing since sliced bread. A great deal of the business carried out by Danske Bank in Spain was Equity Release though straight loans to purchase property were also signed. However, judging by how many equity release contracts we have knowledge of, in so many different places in Spain, we can say Danske’s scaremongers managed to make their lie, no matter how outrageous, a truthful story by repeating it often enough. The most influential Spanish online news site, El Confidencial has written a damning article about the dubious practices of Jyske Bank Gibraltar, in Spain. 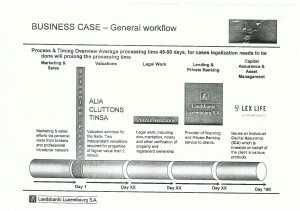 The piece, clearly inspired -and acknowledged twice- by a post published on ERVA, questions the activities of Jyske Bank Gibraltar in Spain and reminds that the bank was recently fined 1,7 million Euros for refusing to disclose sensitive information demanded by Spanish authorities pursuant to anti-money laundering legislation. The article considers Jyske Bank to be “suspicious” of acting in breach of Spanish tax and anti-money laundering provisions, just what Switzerland was accused of doing for years, but on a worldwide basis (only to finally budge under very serious pressure from the U.S.).